164 MMS October 2017 mmsonline.com MODERN EQUIPMENT REVIEW E xair's model 1004SS M4 NPT back blow air nozzle delivers a very small, effective airflow for blowing debris and liquids from the internal diam- eters of small pipes or hoses, channels, bores, holes, internal threads, and other internal part features. An array of holes provides a forceful 360-degree airflow to clear out coolant, chips and light oils from machining processes. The nozzle is also designed to prevent chips from blowing fur ther into a par t, tube or pipe and eliminate safety hazards created by blowing debris out the far end of a pipe or tube. 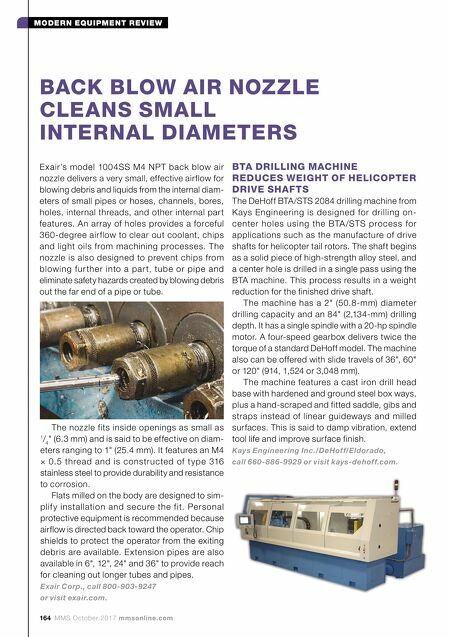 BACK BLOW AIR NOZZLE CLEANS SMALL INTERNAL DIAMETERS BTA DRILLING MACHINE REDUCES WEIGHT OF HELICOPTER DRIVE SHAFTS The DeHoff BTA/STS 2084 drilling machine from Kays Engineering is designed for drilling on- center holes using the BTA /STS process for applications such as the manufacture of drive shafts for helicopter tail rotors. The shaft begins as a solid piece of high-strength alloy steel, and a center hole is drilled in a single pass using the BTA machine. This process results in a weight reduction for the finished drive shaft. The machine has a 2" (50.8-mm) diameter drilling capacity and an 84" (2,134-mm) drilling depth. It has a single spindle with a 20-hp spindle motor. A four-speed gearbox delivers twice the torque of a standard DeHoff model. The machine also can be offered with slide travels of 36", 60" or 120" (914, 1,524 or 3,048 mm). The machine features a cast iron drill head base with hardened and ground steel box ways, plus a hand-scraped and fitted saddle, gibs and straps instead of linear guideways and milled surfaces. 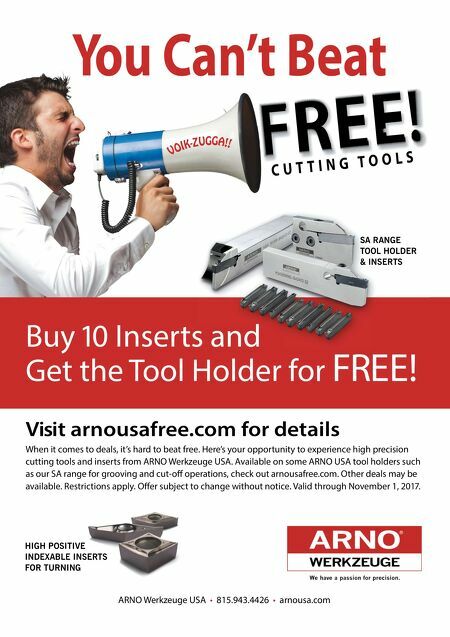 This is said to damp vibration, extend tool life and improve surface finish. Kays Engineering Inc./DeHoff/Eldorado, call 660-886-9929 or visit kays-dehoff.com. The nozzle fits inside openings as small as 1 / 4 " (6.3 mm) and is said to be effective on diam- eters ranging to 1" (25.4 mm). It features an M4 × 0.5 thread and is constructed of t ype 316 stainless steel to provide durability and resistance to corrosion. Flats milled on the body are designed to sim- plif y installation and secure the fit. Personal protective equipment is recommended because airflow is directed back toward the operator. Chip shields to protect the operator from the exiting debris are available. Extension pipes are also available in 6", 12", 24" and 36" to provide reach for cleaning out longer tubes and pipes. Exair Corp., call 800-903-9247 or visit exair.com.